The team at ServiceMaster Restoration by Simons is thrilled to announce that our featured small business owner for November is Emily Carlson of Solstice Stained Glass. Congratulations, Emily! You are a great role model for aspiring female business owners. Check out our interview with Emily below. What is the name of your company, and what do you do? Solstice Stained Glass. We work with a staff of European and locally trained stained glass professionals. Solstice Stained Glass performs restoration, repair, design, fabrication and commission of architectural stained glass for owners of fine residential, religious, educational and institutional buildings. Our clients and collaborators include homeowners, restoration & design/build contractors and architects, and facilities directors & managers. When I stumbled into a stained glass studio on Chicago’s north side in 1999, after managing a different studio for several years, I launched my studio on Chicago’s west side in 2008. What is the scale of your work? The breadth of work ranges from the repair of single broken pieces of glass in a leaded or stained glass window through restorations and commissions of stained art glass for entire buildings. 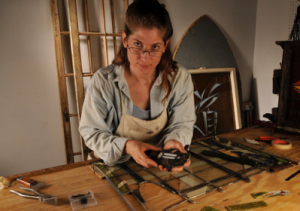 Have you ever restored stained glass after a fire? Yes we have – this stained glass window (above left) was ripped out of its opening by a contractor after a fire. We found it in the front yard, partially buried by the mason’s mortar, and brought it to our studio for work for complete restoration (above right). Is there anything else you would like us to know about your business? Whether for new work or restorations, the age-old practices and materials of the stained glass trade are still pretty much the same as they were over a thousand years ago; the main difference is the hole in the wall into which we plug our soldering irons to get heat, instead of an oven with open flame. Yet, with these commonalities, we understand that each and every project is unique, and we treat each with the same high level of care.